The prayer sheet can be downloaded in English and Spanish here: A4 Paper Size ; US Letter Size (PDF). Mercy International Association is happy to announce that Anna Nicholls rsm has been appointed to the recently advertised position of Assistant Director Heritage & Spirituality. Anna is a Mercy Sister from Auckland, New Zealand. She has ministered in New Zealand and Samoa, particularly in the education field and has developed programmes for staff induction, for student leadership programmes and for youth retreats and other formational experiences. She has served in roles of Director of Religious Studies, Assistant Principal Special Character and Deputy Principal – Director of Learning for Mission. We welcome Anna, who will take up her role in March 2017 and look forward to collaborating with her in the development of the MIA Heritage and Spirituality agenda. Applications are invited for the position of Mercy Global Action Coordinator at the UN (Commencing 1 February 2017).The position will be based in New York, with initially a 3 year contract. Denise Boyle fmdm visited the Mercy family in Newfoundland during the week of 10-18 October, 2016 where she engaged with Sisters, Associates, groups and individuals in a mutual learning process. As Director of Mercy Global Action she met with strategic groups like the Sisters of Mercy Leadership Team - Srs. Elizabeth Davis, Sheila O’Dea, Diane Smyth and Elizabeth Marrie and many others. 'God of the living and the dead, through the power of Christ's resurrection you have conquered sin and death forever. Catherine McAuley told us that each day is a step we take towards eternity. May we continue thus from day to day until we take the last step, which will bring us into your presence. Then we shall be reunited with those we love and every tear shall be wiped away. We ask this through Jesus, our Redeemer and brother. 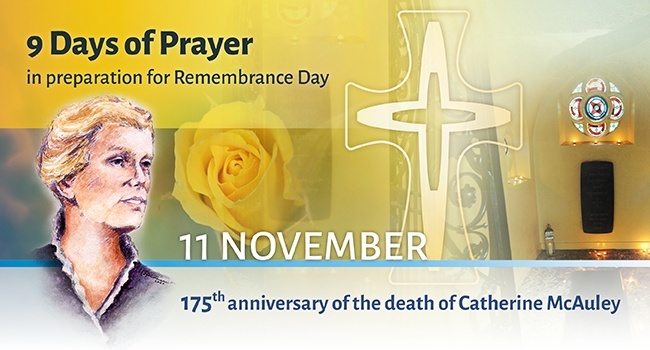 are invited to celebrate the Eucharist at 12.00 p.m.on the 175th Anniversary of Catherine’s death. Messages to: Madeline O' Hanlon on email using the subject line ‘Mass/lunch Nov 11’, or ring 01 6618061 in business hours. God of love and mercy, touch with your healing power and restore to full health: Mary Lou Mercado, John Ings, Clare Murphy, Peter O'Reilly, Carole, Sharon Oldham, Rita O'Connor, Christina Carinato, Tom Conway and all whose names are on our prayer list. We ask this with confidence through the intercession of Venerable Catherine McAuley. Amen. Our group considered/reflected on our focal issue - “A compassionate response to the Refugee Crisis” in the light of Biblical, Theological, Spiritual and Mercy Traditions. Keeping in mind ‘The Cry of the Earth, the Cry of the Poor’ we reflected on texts from Scripture. The two videos that caught our attention were John Haught and Mary C. Sullivan. Be a community that addresses the injustice which keeps minorities and those who are different outside the centre of things. Before the Flood made its television debut on National Geographic's channel in 171 countries and 45 languages on Sunday, 30 October. It was released across digital and streaming platforms around the world as part of the network's commitment to covering climate change. The following texts, insights and vision were shared with enthusiasm, conviction, heartfelt awe and appreciation. This sense of conviction and urgency has called forth a radical shift in our thinking and in our theology. Our actions and way of being in the world are flowing and will continue to flow from this ongoing awareness. Great appreciation was expressed that we are having this opportunity for reflection at this stage of our lives – enabling and challenging us to see Creation in a new way, and offering us a new Image of God. We began Stage 3 after having studied the proposed Adani Mine in the Galilee Basin of central Queensland. We became aware of the devastating effect this mine would have on the environment and climate change. It is a case of power and money over the environment. To continue to deepen our awareness of our relationship with all of creation. To be alert to listen to the genuine voices calling out for care of creation. As Election Day nears, the Institute of the Americas Extended Justice Team would like to share with you "Nine Days of Prayer for a United Nation." Mercy and compassion are most needed at this time of divisiveness and harsh rhetoric on all sides. We invite you to pray with us for the candidates, their supporters and all voters, that we recognize and honor the dignity of each person, even those with whom we disagree politically, in these final days of the election season. Pope Francis reminds us, in Laudato Si, that "true statecraft is manifest when, in difficult times, we uphold high principles and think of the long-term common good." May the common good be uppermost in the minds of everyone at this time. On Friday, 4 November, the Institute’s Sustainability Policy: 'An Integrated Approach to Sustainable living' will be launched online by Berneice Loch rsm, Institute leader. The launch will also be recorded and available for viewing after the event. Further details are linked to this item. Kathleen Rushton rsm reflects on the brief conversation between two dying men, Jesus and his companion, in Luke 23: 35-43. Sr Kathleen writes: 'The end of the year of mercy is a new beginning of seeing and living through God's mercy. In Jesus' reply to his dying companion, God breaks into a situation that seems beyond mercy and hope. This is our encouragement. Deirdre Mullan rsm representing the Partnerships with Religious Congregations and UNICEF was a special guest of Noeleen Heyzer, Under-Secretary General at the UN, for the conference – Lead by Example – At the Frontiers of Women’s Leadership, which was held at St. Ann’s College in Oxford recently. 1969: Doncaster and Hunslet communities send first Sisters to Peru. These are the 25 best films of the 21st century according to film critics around the globe, and where you can watch them for yourself. A selection of the sayings of Catherine McAuley (1778-1841), including a reprint of the 1868 publication of her "Practical Sayings" by Mary Clare Moore, London. With a new preface, introduction and appendix by Mary C. Sullivan rsm (Americas). The theme of mercy in 11 other religious traditions. This compendium was produced by the Pontifical Council for Interreligious Dialogue for the Year of Mercy. RENATE - the European network of religious against trafficking is holding its second assembly in Rome from 6-12 November, 2016. Details can be found here. The opening and closing liturgies will be livestreamed. Speakers presentations will be posted online after the assembly.